LONDON (Reuters) - Britain's No. 4 supermarket Wm Morrison will attempt to win customers from rival's long established online grocery businesses by making it easy for them to switch, Chief Executive Dalton Philips told reporters on Thursday. "By enabling customers with one click to import their favourites we'll be bringing switching to the online food market," Philips said as he detailed the firm's online grocery plans at a salmon-packing factory in Stratford, east London. UK online grocery sales are forecast to grow 16.9 percent to 6.9 billion pounds ($11.2 billion) in 2013, according to market research group Mintel. Bradford, northern England-based Morrisons is the last of Britain's "big four" supermarkets to sell groceries over the internet, playing catch-up with market leader Tesco, Sainsbury's and Wal-Mart's Asda who have been expanding their online businesses since the late 1990s. Morrison's plan to differentiate itself is to focus more on fresh food and what it hopes will be superior customer service. It says the switching software will be a unique feature on its website that will enable shoppers to easily import their list of favourite grocery items from the sites of Tesco, Asda, J Sainsbury, Waitrose and even Morrisons' online grocery partner Ocado. Morrisons' late entry into both online grocery and local convenience stores, the sector's two fastest growing channels, has dented its profit and market share. Earlier this month it posted a seventh straight fall in quarterly underlying sales. To address this the firm agreed in May to invest 216 million pounds in a 25-year deal with online grocer Ocado that will give it an online grocery capacity of 500 million pounds of sales and see it start home deliveries by January 2014. It is also aggressively opening "M local" convenience stores, with a target of 100 by the end of the year and 200 by the end of 2014. "There's a huge difference between late and too late. Yes, we are late but we are not too late," said Philips. "We have used that time wisely to learn from others." Features will include being able to order meat cut to a specific size from a virtual butcher, product ratings from experts and a "doorstep check" with customers that they are satisfied with all fresh produce on delivery. If they are not, refunds and vouchers will be issued. A minimum spend of 40 pounds will also apply and charges for one hour delivery slots will be one pound for off-peak deliveries, three pounds for standard and five pounds for peak evening slots. The industry average delivery charge is about 3.50 pounds according to Philips. Morrisons, which already sells non-food items online, had held back from selling food because it had doubts over the profitability of delivering groceries to customers' homes. Ocado has yet to make a pretax profit in a decade of business. 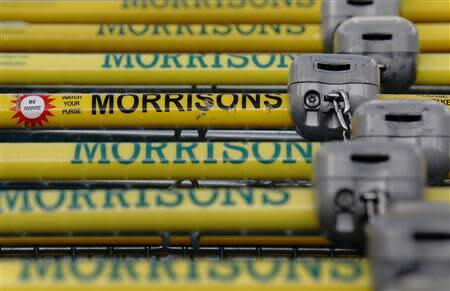 Morrisons expects to make a profit from online grocery from the 2016-17 year. Morrisons will start online food deliveries in Warwickshire, central England, on January 10 direct from a distribution centre in Dordon. An extension to Yorkshire in northern England will follow shortly afterwards. By the end of 2014 it expects to serve more than 50 percent of British homes, including London, with an online offering.